Dhaka, 13 April, Abnews: Prime Minister Sheikh Hasina yesterday said no party except Awami League would be able to uphold the country's ongoing socioeconomic progress. Bangladesh has become eligible to be a developing country through fulfilling necessary conditions of progress. And, the pace of progress would remain continue only if people give vote to Awami League to power in next election, she said. 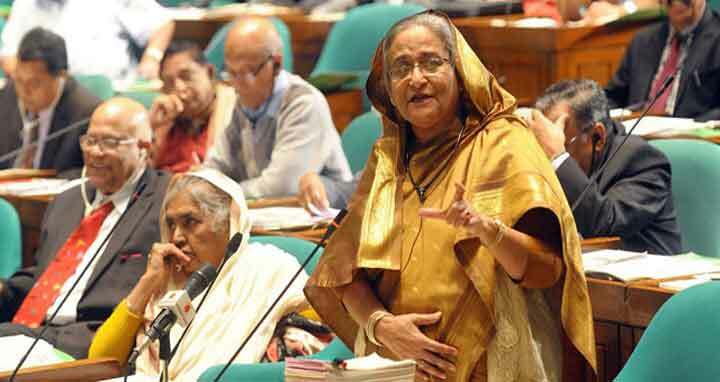 Prime Minister and Leader of the House Sheikh Hasina said this while delivering valedictory speech in the 20th session of the 10th Jatiya Sangsad with Speaker Shirin Sharmin Chaudhury in the chair. Sheikh Hasina said, "We will be able to come to power if people elect us. And, we will be able to open up the way of making a prosperous Bangladesh if we get the opportunity to serve the nation again." "Bangladesh would never be backtracked even if another party comes to power in the next polls and doesn't destroy our achievements," she said. She however expressed her doubt that any party except Awami League would do this as BNP and Jamaat government could not sustain progress of country in various sectors including food production, power generation and improvement of overall literacy rate. Sheikh Hasina extended her thanks to the opposition party for their support to make the parliament effective saying the house is now free from all dirty practices. "Parliament now deals with the real problems of the people and the opposition party is doing their job very constructively," she said. The real parliamentary practice is being followed now and the government and the opposition are working in a very congenial atmosphere, she added. Bangabandhu was killed at a time when he was taking forward a war ravaged country and people of Bangladesh were hopeful to build their future. "We always have nourished a plan to make a developed Bangladesh and materialize the dream of the Father of the Nation Bangabandhu Sheikh Mujibur Rahman," she said. Sheikh Hasina said she always thought herself as a servant of the people and the opportunity came after formation of the government in 1996. "To me, she said, power means an opportunity to serve the people. So, I never thought what I have gained or lost." Sheikh Hasina said Bangladesh has been qualified to be a developing country due to implementation of various socioeconomic plan of her government. Bangladesh has been qualified for the status of a developing country by fulfilling all three criterions. In no accounts, the success would not be diminished in next six years, she said. The Prime Minister said people get nothing from those political leaders, who come to power to make their own fortune. In the past, no political party except Awami League worked for the people. The Prime Minister said her government is making stride to make every village a township where people would enjoy every unbar facilities and they would no more be neglected. She said no people of Bangladesh will remain homeless and no people will remain uneducated and die without medicare. The government has ensured food security of every people and now it has concentrated on nutrition, she added. Sheikh Hasina said the government is providing necessary supports to the farmers and trying for mechanization of agriculture. Most areas of the country have come under electricity coverage, she added. The Prime Minister said the poverty rate reduced to 22 percent while huge scope has been created for employment. Around ten lakh people have gone abroad with job in 2017, she said.